Don’t throw away your old shoes! Turn them into eco friendly bird feeders instead. Our son either outgrows or wears out his shoes every few months. He is all boy, for sure! Since they aren’t in any kind of shape to pass on to another child, we use them in another way entirely. Can you spot the toddler sized rain boots? 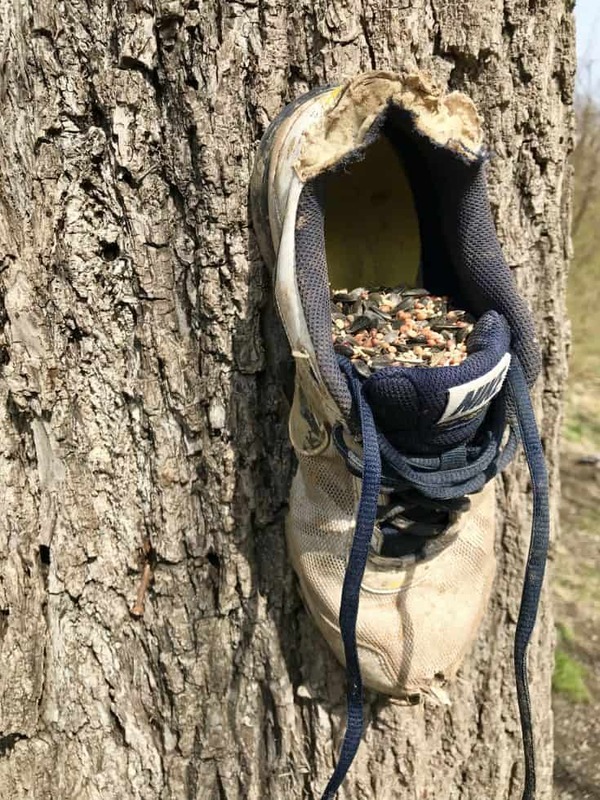 It would be super cute to save all of a child’s shoes and dedicated an entire tree of bird feeders to them. If you have multiple children, you could have a whole forest! We are also in a unique situation where we live in a hollow that has been occupied for decades. Rain, snow and our animals, especially pigs and dogs, often uncover some interesting items from previous dwellers. Antique bottles, an enamel tabletop, even creepy old baby dolls have made there way to our house. 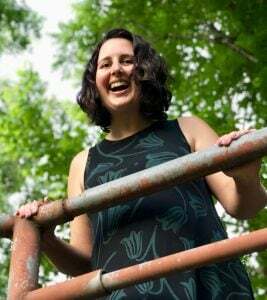 I’ll spare you the photos, but you can see them on our Instagram page if you’re interested. 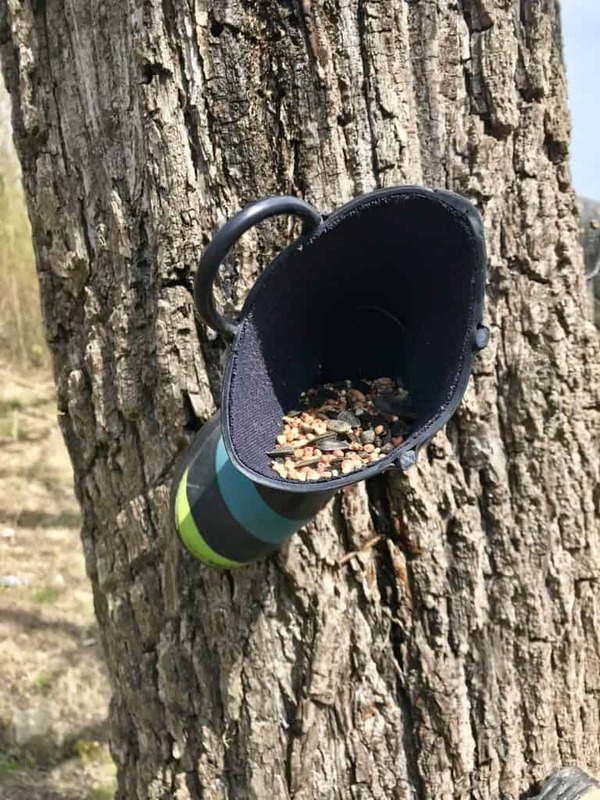 There are several ways to adhere the eco friendly bird feeders to a tree. We chose to screw them in directly with a drill. You can also tie them up or use bungee cords. Another idea is to skip the tree entirely. Add shoes to a fence post, porch post, or a post meant just for eco friendly bird feeders. With any method you choose, make sure they are secure enough to withstand storms and strong winds. You don’t want shoes becoming dangerous projectile objects. 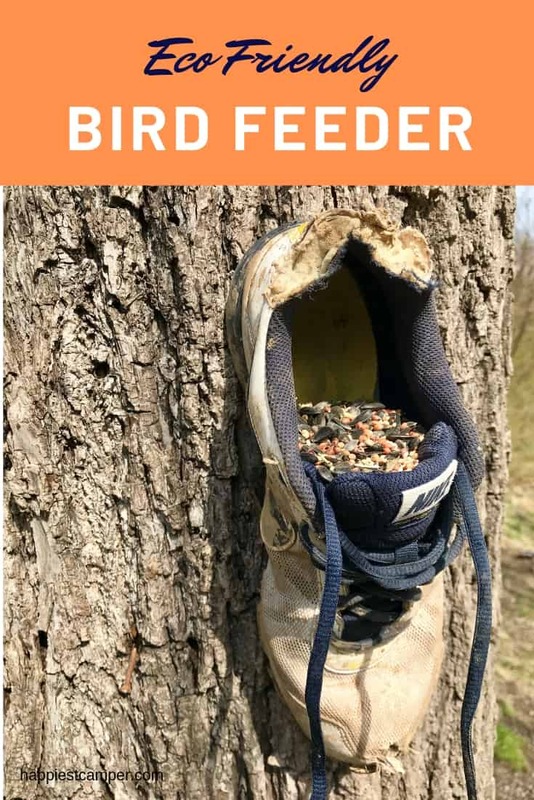 Then fill the shoes with your favorite bird seed. We began seeing birds visit our eco friendly bird feeders the next day. Cardinals especially enjoy black oil sunflower seeds. We already keep them on hand for the chickens too. Next our goal is to photograph a bird eating from the one of the shoes. If only there was more time in the day. Attach the shoe(s) to a tree or post with a drill and screws or bungee cords. Make sure the shoes can withstand storms and high winds. 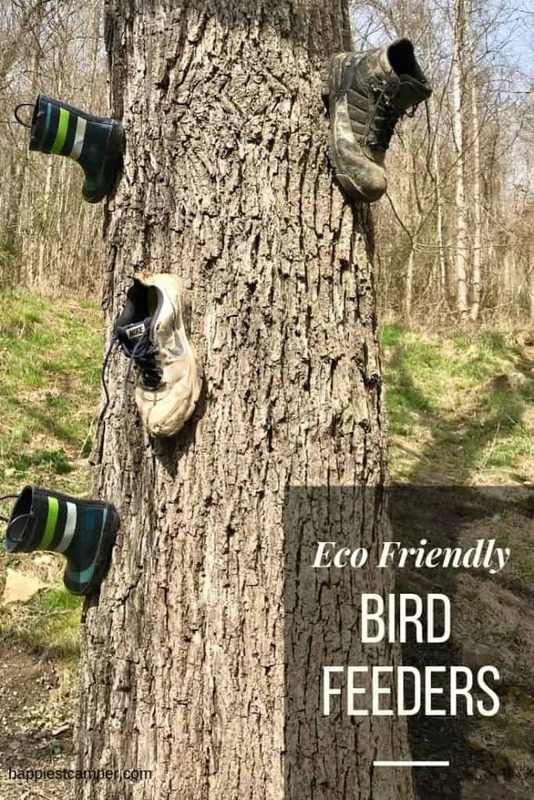 Fill shoes with bird seed.